Anthropocene is a 21st century term popularized by atmospheric chemist and nobel laureate Paul Crutzen for what will perhaps be recognized as a new geologic epoch. 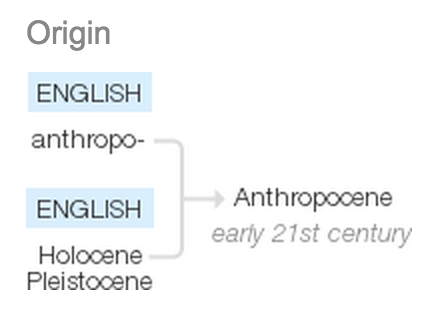 The roots of the word are anthropo- for man and cene for new. No date is recognized as the start of the Anthropocene, but atmospheric data seems to point to the early 19th century industrialization that occurred during the time of the Industrial Revolution. Other scientists indicate it should start with the Atomic Age of the 1950s. The Holocene began about 11,700 years ago and includes the growth of the human species. The Pleistocene lasted from about 2,588,000 to the Holocene and spanned the most recent period of repeated glaciations. All of these characteristics are widely held to be linked to human activities. "Two billion years ago, cyanobacteria oxygenated the atmosphere and powerfully disrupted life on earth. But they didn’t know it. We’re the first species that’s become a planet-scale influence and is aware of that reality. That’s what distinguishes us." Coping with the anthropocene: How we became nature, De Gruyter, ScienceDaily, 17 March 2015. What is the Anthropocene and Are We in It?, Smithsonian Magazine, January 2013.